Western blot analysis of extracts from untransfected MCF-7 cells, and COS-1 cells transfected with wild-type or mutant ER alpha, stimulated with EGF and E2, using Phospho-Estrogen Receptor alpha (Ser118) (16J4) Mouse mAb (upper) or control estrogen receptor alpha antibody #2512 (lower). 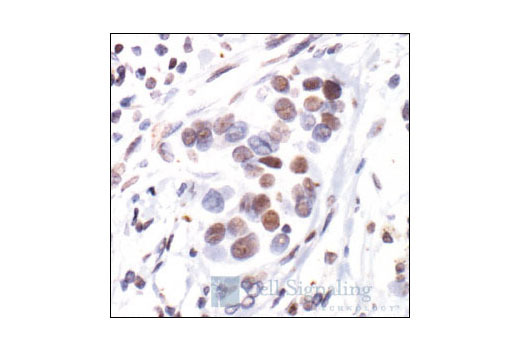 Immunohistochemical staining of phosphorylated estrogen receptor alpha in paraffin-embedded human breast carcinoma showing nuclear localization, using Phospho-Estrogen Receptor alpha (Ser118) (16J4) Mouse mAb. Secondary Antibody Conjugated to HRP: Anti-mouse IgG, HRP-linked Antibody (#7076). Incubate membrane with Anti-mouse IgG, HRP-linked Antibody (#7076 at 1:2000) and Anti-biotin, HRP-linked Antibody (#7075 at 1:1000–1:3000) to detect biotinylated protein markers in 10 ml of blocking buffer with gentle agitation for 1 hr at room temperature. Antibody Diluent PBST/5% normal goat serum (#5425): To 5 ml 1X PBST, add 250 µl Normal Goat Serum (#5425). 1X PBST: To prepare 1X PBST, add 50 ml Phosphate Buffered Saline with Tween® 20 (PBST-20X) (#9809) to 950 ml dH2O, mix. 3% Hydrogen Peroxide: To prepare, add 10 ml 30% H2O2 to 90 ml dH2O. Detection System: VECTASTAIN® Elite ABC, including biotinylated secondary antibody (Vector Laboratories). Incubate sections in three washes of xylene for 5 minutes each. Incubate sections in two washes of 100% ethanol for 10 minutes each. Incubate sections in two washes of 95% ethanol for 10 minutes each. Wash sections twice in dH2O for 5 minutes each. Wash sections in dH2O three times for 5 minutes each. Incubate sections in 3% hydrogen peroxide for 10 minutes. Wash sections in dH2O twice for 5 minutes each. Wash sections in wash buffer for 5 minutes. Block each section with 100-400 µl of preferred blocking solution for 1 hour at room temperature. Remove blocking solution and add 100-400 µl primary antibody diluted in recommended antibody diluent to each section. Incubate overnight at 4°C. Prepare ABC solution per manufacturer's recommendations. Add 100-400 µl biotinylated secondary antibody, diluted in TBST per manufacturer’s recommendation, to each section. Incubate 30 minutes at room temperature. Remove secondary antibody solution and wash sections three times with wash buffer for 5 minutes each. Cover sections with 100-400 µl pre-mixed ABC solution as needed and incubate in a humidified chamber for 30 min at room tempature. Wash section three times with wash buffer for 5 min each. Wash sections in dH2O two times for 5 minutes each. Incubate sections in 95% ethanol two times for 10 seconds each. Repeat in 100% ethanol, incubating sections two times for 10 seconds each. Repeat in xylene, incubating sections two times for 10 seconds each. 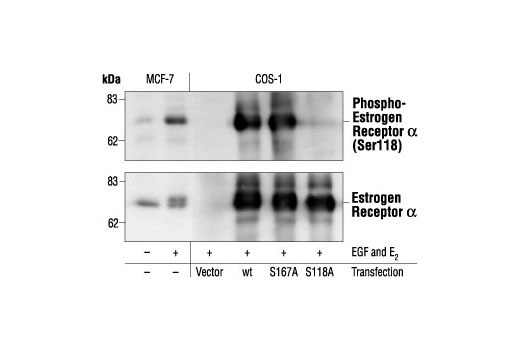 Phospho-Estrogen Receptor α (Ser118) (16J4) Mouse mAb detects endogenous levels of estrogen receptor α only when phosphorylated at serine 118. It does not cross-react with phosphorylated estrogen receptor β. Monoclonal antibody is produced by immunizing animals with a synthetic phosphopeptide corresponding to residues surrounding Ser118 of human ER α.
Estrogen receptor α (ERα), a member of the steroid receptor superfamily, contains highly conserved DNA binding and ligand binding domains (1). Through its estrogen-independent and estrogen-dependent activation domains (AF-1 and AF-2, respectively), ERα regulates transcription by recruiting coactivator proteins and interacting with general transcriptional machinery (2). Phosphorylation at multiple sites provides an important mechanism to regulate ERα activity (3-5). Ser104, 106, 118, and 167 are located in the amino-terminal transcription activation function domain AF-1, and phosphorylation of these serine residues plays an important role in regulating ERα activity. Ser118 may be the substrate of the transcription regulatory kinase CDK7 (5). Ser167 may be phosphorylated by p90RSK and Akt (4,6). According to the research literature, phosphorylation at Ser167 may confer tamoxifen resistance in breast cancer patients (4). Mangelsdorf, D. J. et al. (1995) Cell 83, 835-839. Glass, C.K. and Rosenfeld, M.G. (2000) Genes Dev 14, 121-41. Chen, D. et al. (1999) Mol Cell Biol 19, 1002-15. Campbell, R.A. et al. (2001) J Biol Chem 276, 9817-24. Chen, D. et al. (2000) Mol Cell 6, 127-37. Joel, P.B. et al. (1998) Mol Cell Biol 18, 1978-84.